For stronger public policy creation and community building, the nonprofit sector needs to connect differently with residents and groups already active in our communities. How can your nonprofit engage local residents more effectively and connect to their lived experience to shape organizational priorities and decisions? Find out in this webinar! 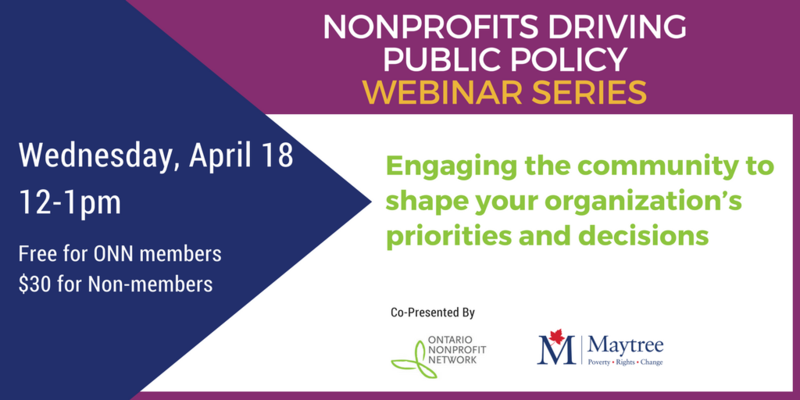 What is public policy and does your nonprofit need a strategy? We've partnered with Maytree and its Policy School and CivicsXchange programs in Toronto to connect nonprofits to experts and resources for more effective public policy. Our aim is to provide accessible, action-oriented resources to strengthen the sector’s role in creating, influencing and implementing better public policy for thriving communities.